Confederate Arms maker Cook & Brother one dollar note. Cook & Brother started making rifles and bayonets for the CSA but the government had no money to pay them so Cook & Bro. issued their own notes as payment for their debts. C&B operated in New Orleans from June 1861 until the fall of the city in April '62. This note is dated July 1861 in N.O. A rare note when found they sell for $325-350 in this condition. Bargain priced! (5 or less known). Not dug and with little wear. Holed as these tokens are sometimes found possibl;y to sew inside a pocket to prevent theft or loss. Sutler note - Scotts 900 United States Cavalry. This was actually the 11th NY Cavalry, known as Scotts 900. Originally formed in Staten Island from Dec '61 thru May '62 it then recruruted in many areas of NY. The unit saw service from Washington to Florida where many died when a steamer they were on sank in on Dec. 22, 1864. 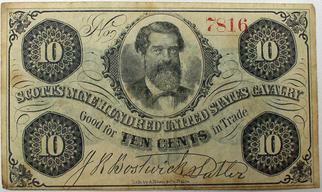 A popular and attractive note in good condition. Sutler token, 2nd PA ARTy -Wm E.WOOD.